After being throttled by the Seahawks on Sunday, the Vikings (8-4) will have just four days to prepare for a talented Cardinals squad (10-2). Daniel House previews the game and provides his keys to victory. After being throttled by the Seahawks on Sunday, the Vikings (8-4) will have just four days to prepare for a talented Cardinals squad (10-2). Minnesota will be without four defensive starters and will be playing a recently signed free agent and practice squad player at safety. A short week, combined with injuries, and a plane ride to Arizona doesn't sound like a recipe for success. The Cardinals have top-five units on both sides of the ball. Their offense is high-powered and Carson Palmer is playing at an MVP level. Not to mention, their secondary and defensive line have gotten the job done recently. You could argue that Arizona is the best team in the league right now. The Vikings have to travel, play without four starting defenders, and win in primetime. They are 1-15 in their last 16 nationally televised road games. The variables aren't aligning for a positive ending on Thursday. However, there are a few ways the Vikings could keep the game close or even pull an upset. After watching the film, quarterback Carson Palmer is playing at an extremely high level. Mike Zimmer even mentioned that this week. He has thrown for 3,693 yards and 29 touchdowns this season. He's just one away from tying the franchise record for most touchdown passes in a season. Palmer has been shredding teams in the vertical passing game and the placement of his throws have been spot on. Their offense is the top-rated group in the league and dropped a season high 524 yards on the Rams last week. Wide receiver Larry Fitzgerald has notched 50+ yard performances in three consecutive games and is on pace for a career season. Not to mention, John Brown and Michael Floyd have been contributing too. They combined for 13 catches and 217 yards through the air last week. Palmer has weapons and finds them in a variety of ways. He's firing passes into tight windows and is making the accurate throws necessary to be successful. With Shaun Prater and Anthony Harris likely seeing time at safety, the Cardinals are going to exploit the deficiencies in the back end. The Vikings defense was demoralized by Seattle last week and will be without four defensive starters. Linval Joseph, Anthony Barr, Harrison Smith, and Andrew Sendejo have already been ruled out. That's not a great recipe for success. It's a short preparation window and with limited resources, the Vikings might have some problems keeping up with a high-powered Arizona offense. Andre Ellington has been ruled out for this game, but David Johnson is no slouch either. He rushed for 99 yards on 22 carries, while adding 21 yards and a touchdown through the air. Johnson is a dual-threat running back and can make plays both on the ground and in the passing game. Without Anthony Barr, the other linebackers will need to be prepared to tackle him in space. If the Cardinals get their running game going, their offense becomes an even bigger threat. The Vikings let Thomas Rawls run wild last week and haven't been successful when teams pick up big chunks on the ground. They don't have the solid all-around defense to be lopsided as a unit. They will need to isolate a high-powered offense and it won't be easy with a low amount of resources on defense. As I already noted, the Vikings will be without Anthony Barr, Harrison Smith, Linval Joseph, Brandon Watts, and Andrew Sendejo. That list includes four defensive starters at critical positions. With that being said, the week is already short and they're playing against a high-octane offense. Shaun Prater and Anthony Harris will likely be seeing the work in the back end of the defense. It's hard to expect good results with a thin squad. However, you know this group has a chip on their shoulder after they were embarrassed on their home field by Seattle. The Vikings are 3-0 this season after a loss and respond well in this situations. Battling through these injuries will be important, but it won't be easy against a quality opponent like Arizona. It's going to take a gritty performance in all three aspects of the game for the Vikings to pull an upset on the road. The Vikings offensive situation needs to get figured out quickly. Accumulating 125 total yards and just nine first downs won't win any football games. The offensive line hasn't been protecting, Teddy Bridgewater has played poorly, and the receivers aren't running good routes to get open. All of those variables won't contribute to a successful offense. It's even harder when the play calling becomes one dimensional. 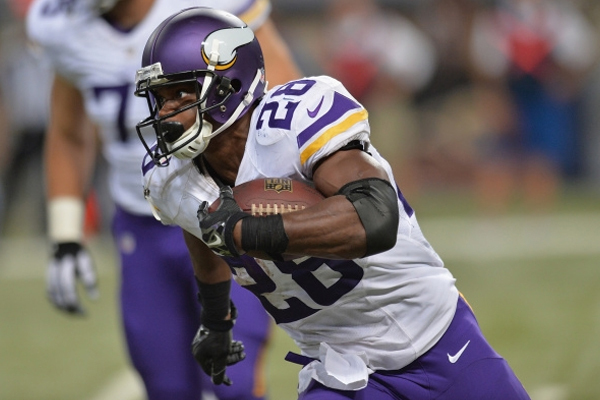 Adrian Peterson had just eight carries last week and was nonexistent in the game plan. Not having your best player involved in the game is unacceptable. The Vikings need to bring in heavy packages to run the ball effectively. Controlling the clock will keep the Arizona offense off the field. Additionally, more quick passing can benefit both Bridgewater and the offensive line. First off, Bridgewater is meant to play in an offense that is structured in that way. Secondly, the offensive line doesn't have to hold their blocks as long. Running seven-step drops with this personnel group doesn't make sense. Being successful on offense isn't going to be easy though. Arizona is the fourth-rated defensive unit and held St. Louis to 212 yards and a measly nine first downs last week. Their secondary is led by Patrick Peterson and Tyrann Mathieu, so passing the ball will be difficult. The receivers have already had trouble getting open and it won't get any easier against this group. It's going to take a different offensive philosophy to yield positive results for this Vikings offense. The Vikings are 1-15 last 16 nationally televised games played outside of their home stadium. They can't win under the lights -- it's that simple. However, the Vikings' coaches have created a culture change that has made this type of criticism a form of motivation. It won't be easily correctable against Arizona, but it can be done. The reoccurring theme in these primetime losses have been getting behind right away. This squad isn't built to play in the hole. They have to get off to a convincing start, while controlling the time of possession with Adrian Peterson's legs. If Peterson can't run the ball, the Vikings have no chance.